Parts of the Senate's tax bill — like the repeal of the Affordable Care Act's individual mandate and the sunset of the individual and small business tax cuts despite a permanent corporate tax cut — are endangering its passage. 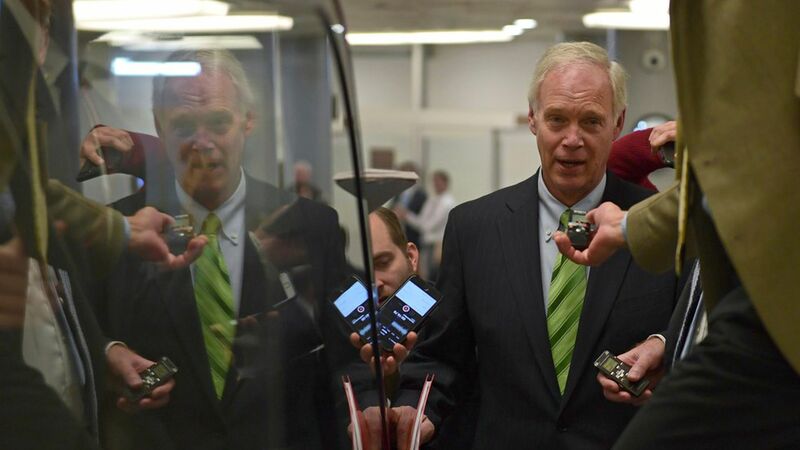 Our thought bubble: Sen. Ron Johnson's declared opposition and the sudden prospect that the GOP could lose a Senate race in Alabama next month giving them only one vote to spare if the tax bill takes longer than a few weeks, have increased the odds of the tax bill's success. Driving Republicans forward is the intense pressure they face for a legislative victory. The health care trio: These three senators sunk the health care bill in July. Inserting an individual mandate repeal into the tax bill has thrown their votes for it into question. Sen. Susan Collins: The mandate repeal will increase premiums for people without health care subsidies on exchanges, which "would wipe out the tax cut that they would get under the bill...It is a political mistake as well because it complicates tax reform, and it means that no Democrat's going to vote for the bill – or it makes it much less likely." Sen. Lisa Murkowski: "Tax reform is complicated, health care is complicated, when you mix the two together, it makes it even more complicated." "My concern is what it might do to insurance premiums... I've got a little bit of homework to do in understanding where that is, because I think that's key to this." "If you're going to include the repeal of the individual mandate, at a bare minimum, you have to have a fix like the Alexander-Murray...What I don't know is whether it helps it sufficiently." Sen. John McCain: He voted against the health care bill because it didn't go through a normal process. He's not happy with how things are going with the tax bill. "I just picked up the newspaper today and they've made a huge change. Every day there seems to be – no, it's not" regular order, he said. "I can't comment on every day's activities...But I lean toward the tax cuts." On whether the tax bill can get back on track: "I have no idea, but I'm insisting on regular order." Deficit hawks and sunset skeptics: The tax bill currently would add $1.415 trillion to the deficit over the next decade. To avoid adding to the debt after that, it ends the individual and small business tax changes after 2025, while keeping the lower corporate rate permanent. Sens. Bob Corker and Jeff Flake have long been regarded as deficit hawks to watch. Both are also retiring, meaning they're free to vote their conscience. Sen. Jerry Moran: He's currently undecided on whether he supports the tax components of the bill. "I would say the individual tax changes should be treated similarly to corporate tax changes as far as their permanency." He said it's also bad optics. While Moran said the inclusion of mandate repeal won't keep him from voting for it, he thinks mixing health and tax is a bad idea. "There is an easier common ground to be found on taxes than there has been on health care, and so again, it takes something that has a greater potential, taxes, of being bipartisan and more broadly supported and reduces that." Sen. Mike Lee is still weighing whether he's ok with the sunsetting rates, his office said. Johnson said Wednesday he currently opposes the bill because it doesn't do enough to help small businesses. Moore is currently polling well behind Democrat Doug Jones in the Alabama Senate race. If the GOP loses this seat and doesn't wrap up their tax work before Christmas, that means it'll have one vote to spare in the Senate.